I just became aware of the advanced selection rules. I already have a my preferred language selected but I would like it to select only forced subtitles. I don't need the full subtitles. On a side note I'd like it to only rip the AC3 core for TrueHD and only the lossless DTS-MA (not the DTS core) for DTS. Weird, I know. I know of only 1 title out there that this will work - Avatar. I own no other titles where there are subtitles that are FLAGGED as "forced". The general rule is that forced subtitles will have their own track, and nothing will have the forced flag. As such, MakeMKV will not find any to save. The only reliable way to determine which track is correct is to rip all of them, then check each one to see if it is just the forced subtitles, and use mkvmerge (from mkvtoolnix) or handbrake to make that the FIRST track in the file. Woodstock wrote: I know of only 1 title out there that this will work - Avatar. I own no other titles where there are subtitles that are FLAGGED as "forced". That's the point. I always select "forced only" on subtitle tracks because I never know if there are any. If there are any forced subtitles they will be ripped. If not MakeMKV will remove the empty track. Taddeusz wrote: If there are any forced subtitles they will be ripped. As Woodstock explained above in the text you quoted they will NOT be ripped since virtually all forced subtitles aren't flagged as such which is why Makemkv CAN NOT recognize them. There are three different subtitle contens possible in an track. Case 1 is often used for foreign subtitles, all subs in one track and the forced with flag set. The MakeMkv "Forced subtitle track" makes only sense for case 1, to extract the forced set subtitles form all others into an extra track. Case 2 makes no sense, but can be used, case 3 is used on many discs, but in this case the MakeMkv "Forced subtitle track" is empty. So it makes sense to always select both options and figure it later with VLC out and remove or reorder the tracks with MkvToolNix. I, like the OP, only care about forced subtitles (on Blu-Ray discs), not the full tracks, so ripping the full subtitle tracks makes it more difficult to zero in on what I need. If a title has no forced English subs, then no subtitle tracks will rip. Use MKVTools to rip the individual subtitle tracks. Load each one into BDSub2Sub to view what the tracks really contain. I have ripped around 200 Blurays and this has worked to find the actual forced subtitle 99% of the time. Once you've identified the forced subtitle track you can/should do one of two things. 1. If you're like me and have a mess of storage and don't want to compress the video, use MKVToolNix to mark the subtitle track as forced, and either remove any other subtitle tracks or ensure none are marked as default. This will cause players such as Kodi, Plex and VLC to display the forced subtitle when appropriate. or 2. If you're using a player that doesn't obey the forced subtitle flag (perhaps DLNA based systems), then you can use HandBrake or the simpler and aforementioned MKVTools to burn the subtitle into the re-encoded video. The main edge cases I've come across are foreign movies that have a different default language, but I know what those are beforehand and just rip the full English subtitle and mark it as forced. I've also come across one disc (UK release of one of the first Bourne movies, can't recall which one) that have no forced subtitles even though I know the film had/needed them. Turns out once in a while they decide to burn the English subtitles in for you at the get go. Very confusing but it happened! Which part of this is the subtitles part? ... Just need to make sure I have both regular & forced set, if the disc has forced aswell, should work, right? Last edited by DJ155 on Wed Nov 21, 2018 4:56 pm, edited 1 time in total. Sets only the forced track (more clearly, forced flagged subtitles in an subtitle track) with "favlang" to on: +sel:(forced&favlang) - This selection is not needed, because the +sel:(favlang) includes this. So what I allready have set is good then? I'm still confused on the sub-title subject. What I want is for any movie where there is a foreign language spoken AND the movie contains an English sub title track, to display that track. I have been ONLY checking the box I indicate in the attached but not the one above it that says SubTitles PGS English. Is that the correct method or do I need to check both boxes. 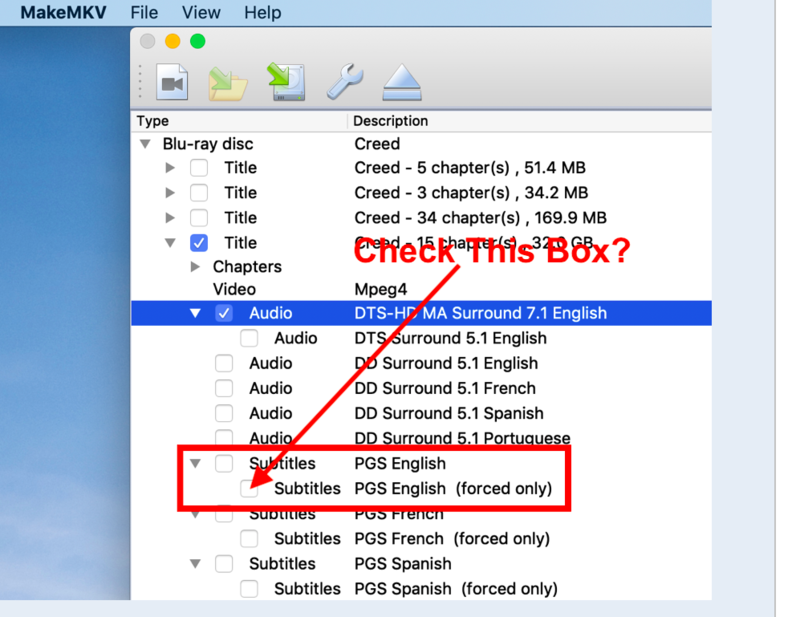 The first box is for extract all subtitles (regardless of forced flag is on or off for an single subtitle) to this track. In case of an mixed subtitle track (included normal and forced flagged subtitles) both are saved in this track. The second box (forced only) extracts ONLY the subtitles which have the forced flag set to on (single subtitle) to an extra track, this means that only all forced flagged subtitles are isolated/separated to an extra track and the non forced flagged subtitles are not included. If you are still unsure, read the above sample in this thread to see what is included or not. Best is to check both boxes and check out with VLC what is in each tracks and remove/reorder the tracks with MVToolNIx.